Good evening, space fans! This week brought a flurry of activity to the ISS. Most importantly, the launch, voyage, and subsequent docking of the Expedition 42/43's Soyuz TMA-15M transport vehicle went perfectly, delivering the three new crew to the space station just a few hours after liftoff last Sunday. 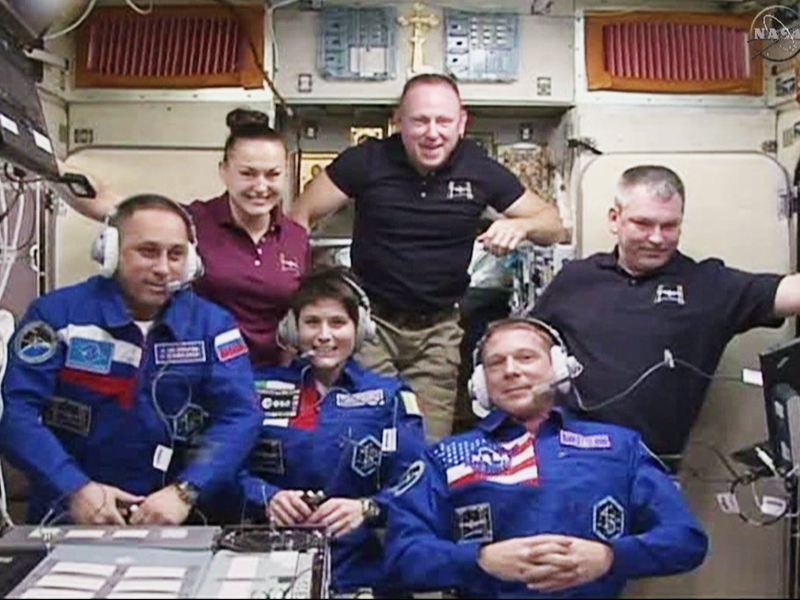 The new crew - cosmonaut Anton Shkaplerov, Italian ESA astronaut Samantha Cristoforetti and NASA astronaut Terry Virts - will remain in orbit until May 2015. Six humans and a space station...what will we learn this time around? Video of the launch and docking was, as usual, breathtaking. Fortunately the snow at the Baikonur cosmodrome in Kazahkstan did not impede the launch. The mission is a somewhat unique one, marking only the second time in ISS history that two women have been aboard the ISS at the same time. The Expedition 42/43 crew will witness numerous transport vehicle arrivals, conduct up to three spacewalks, and continue the biological and technological science projects already underway aboard the station. 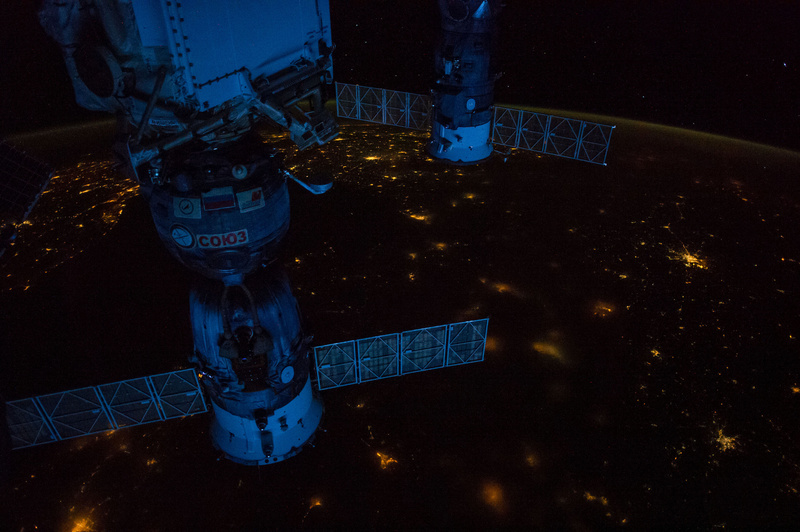 The Soyuz transport craft, rocking the dock at the ISS. Regarding those experiments, the new crew got involved right away, with Flight Engineer Terry Virts assisting commander Butch Wilmore on the Cyclops experiment, which will deploy nanosatellites for scrutiny of small things in space. Virts also worked on a botany experiment and measured air velocity in the Japanese Kibo module. Astronaut Cristoforetti jumped right in as well, setting up equipment for the Blind And Imagined experiment, which measures sensory and visual changes in astronauts who undergo long-duration spaceflight. Other experiments currently underway include tests on plasma and the cardiovascular system in regard to microgravity, as well as tests of radiation exposure in the ISS. A major development in onboard adaptability became apparent this week, as commander Butch Wilmore printed out the first-ever 3D-printed part in space. The "Made In Space" 3D printer successfully created a new part for itself, which bodes well for sustainability not just of the device but for quick and effective replacements for parts of the rest of the ISS. While the plate was slightly stickier than anticipated, this may just be due to its first attempt. Further comparisons will lend more insight. When every pound of cargo and each second of delay counts, it's nice to know that some problems can be solved even without help from Earth. Wilmore also tested out some football flight patterns...you know, for science. And finally, the crew (despite nationality) all enjoyed a Thanksgiving meal together on Thursday. According to Fox News, the dinner included smoked turkey, candied yams, mushrooms, greenbeans, cornbread stuffing, and cherry-blueberry cobbler. The food, which is all freeze dried or thermostabilized (preserved in a manner similar to canning, but in pouches) is reheated via hot water jets due to the absence of other cooking opportunities. While this makes for some interesting efforts at recreating dishes, NASA scientists would like to have space-grown sweet potatoes feature in future Thanksgiving celebrations (and space meals in general.) The nutrient-rich tuber contains good supplies of beta carotene and carbohydrates for maximum energy, and can be grown under artificial light (making them ideal for deep-space mission crops.) In the meantime, the fare was factory-fresh. None of mom's apple pie, but hey, M&Ms! That's all the orbital awesomeness for this week. See you next Sunday, where we'll learn how the new crew are adapting to their digs, see what pops up on the social media feeds of these adventurers, and wonder who's going to win all the photography admiration for this expedition. Watch this space! Commander Wilmore has the artistic award, so far. He captured this image of Saudi Arabia, among others. The market for wearable technology has been steadily increasing, and whether you're rocking a FitBit or waiting for a full-scale neurosensory device, there's no denying that tech-to-go is now a glowing facet of modern life. Now, a new invention may allow you to interface like never before: tapping a touchscreen that's projected onto your flesh. That crashing sound is your productivity flying out the window. 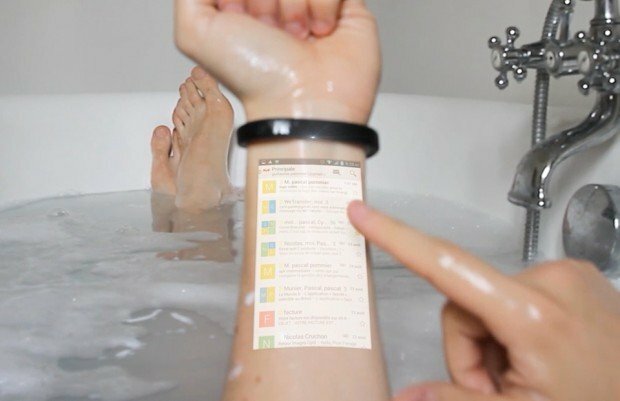 The Cicret bracelet, as reported by Gadgetify.com, uses long-range proximity sensors and a pico projector to illuminate your smartphone screen directly onto your forearm. The "touchscreen" operates by the sensors determining when one has been intervened on by a finger, and data is sent accordingly. While Cicret is still in the developmental phase, it has attracted a fair amount of attention. An anonymizing, secure messenger app is also in production by the same company. Visit their website to learn more about the bracelet or app, and donate if you feel this is something you'd like to rock on your wrist. 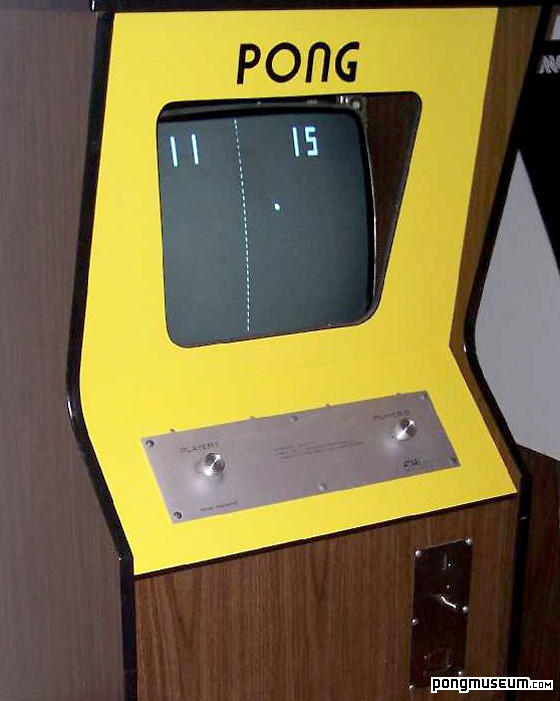 Apologies to those whose cool forearm tattoos precluded the development of this technology. "Is there a glitch in the program or is my ink just awesome?" Shock And Awe: Robot Electric Eels To Protect Our Shores? Oceans are notoriously hard to keep secure from invading threats, particularly those that lurk in the deep. Now, a new development in robotics may help keep our coasts safe thanks to some electric-eel-style swimming 'bots. According to Science Daily, the Anguilliform robotic fish is a droid that dives deep and reports back if it spots any enemies. Designed specifically to venture to more intense depths than a human is capable of, the eel-bots are unobtrusive and agile. They could be trained to find and detonate undersea mines, and maybe even launch counteroffensives against enemy divers. It doesn't look like your typical badass robot, but that is part of its camouflage. The current methodology of keeping our coasts safe to this degree involves attack dolphins (seriously.) To avoid bringing possibly-unethical harm to the animals, the eel-bots make warfare a little more moral. The fish contains an artificial neural network which enables it to autonomously run via its oscillators and an amplitude modulator. Prof. Jianxin Xu, one of the lead researchers and co-authors of the project, was pleased with the results, explaining, "We performed simulations and experiments on the robotic fish, equipped with a motion library to cope with different scenarios, and the results validate the effectiveness of the proposed controllers was able to swim forward and backward as predicted." If you catch one of these while fishing, it's in everyone's best interests for you to throw it back. Could this robotic sushi really help protect us? It's no crazier than some of other ideas, and doesn't harm our humans or dolphins. Let's just hope the other members of the oceanic ecosystem don't think the undulating undersea eels look tasty. The eel-bots better not get into a turf war with the attack dolphins. When you delete your emails, it's likely just to remove clutter, liberating your inbox from constant coupons, ads, e-pleas, etc. But when the CIA and Homeland Security want to delete emails, considerably more eyebrows are raised. According to engadget.com, two of our most totally-not-shady Big Brother organizations want to delete all of their emails that are seven years or older, as well as the emails of all CIA employees who have been retired for 3 years. A plan of action was shown to the National Records and Archives Administration (NARA) that indicated this intent, with only 22 top officials' correspondence to survive the digital culling. History now seems to be written by the digital winners. For two organizations who thrive on intelligence (one where it's in the very title of the company), this seems like a bad idea. Numerous senators, including Dianne Fenstien (D-CA), are actively opposing this plan, fearing the expunging of evidence. The motion was made by the CIA as part of an effort to help streamline its email collection for better management, a mission that NARA had asked of all government agencies to figure out a plan for. Homeland Security's excuse was that it would free up valuable server space ($50 a terabyte per month) and that deletion could also possibly thwart the intended intelligence-gathering of Einstein, their government-website traffic-tracker. They can stash endless info on regular citizens, but heaven forbid their own emails get retained. While this would be a win for private privacy, the overarching scope of government intel is something that people don't want to be able to simply vanish like so many extraordinary renditions before it. Lee Tien of the Electronic Frontier Foundation told Gizmodo, "It's kind of sad. I want to applaud the government for choosing to discard unnecessary data about people. But we have good reason to question the government's reasons because of what we've learned about what we've NOT been told." If you think the government shouldn't be doing the modern equivalent of shredding countless files and burning the confetti, you can tell NARA right here. Sure, you have a spectacular and discerning palate for craft beers and wine, but how can you tell if a beverage is good BEFORE you've even tried it? Now, thanks to a new app that uses science to decide, you can get reviews of your booze before you even crack the bottle. Next Glass is good news; use to choose your booze. According to the NY Daily News, the Next Glass app operates like a Pandora of libations, guessing which drinks you'd like after you upload photos of your preferences (both for and against.) 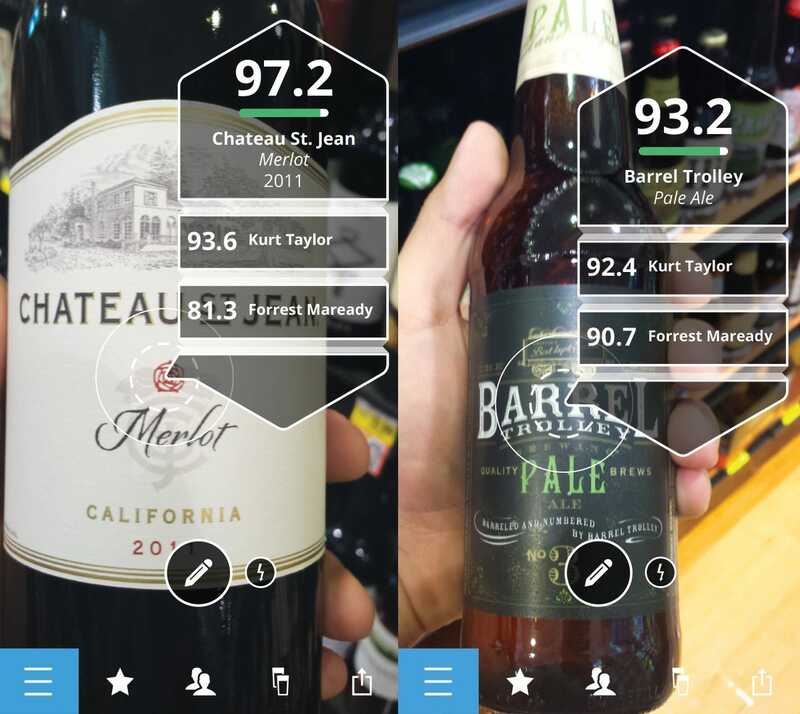 Using a "Genome Cellar" that has been developed by running tens of thousands of beverages through a mass spectrometer to determine their exact chemical composition, the app is able to project its findings by cross-referencing your prefs with their flavor profiles. Trace Smith, Next Glass's COO, told the Huffington Post, "Each bottle that we run through the mass-spec, we get over 20,000 individual chemical attributes. We're looking at each of these bottles at a molecular level...We see the data of what they do and don't like, and based on that info, we see what other bottles they'll like." One simply has to upload an image of a pondered-on drink's label, and a scored "review" from Next Glass will pop up, determining your compatibility. You can also check out what your friends have been sipping on (and cheer or make fun of them for it appropriately) as well as post your own whiskey-steeped thoughts, or read reviews from other revelers. Next Glass is free on iOS and Android platforms. Cheers! They put 30,000 bottles of booze through this, just so you can tell if it tastes good. Give Next Glass a shot. Sometimes it's the little developments that make all the difference. In the course of your daily routine, how many times have your keys factored into making things difficult or, if you forgot them, downright unaccessible? Now, a new type of lock enables you (and others that you choose) to have easier access without worrying about your keyring. According to theverge.com, the August is a new "smart lock" that uses computer code as its key. The code can be changed as often as you like for security, or shared for sociability. If you're away on business and still need to let the dog walker in, you can text them the unlock-code, and then have it auto-destruct after a desired time. All prospective thieves see is a shiny silver stop sign. August co-founder and CEO Jason Johnson feels he is filling an important niche. He explained, "The past two years I've been working on this, if there is a phrase I've heard more than anything, it's 'I hate keys.'" 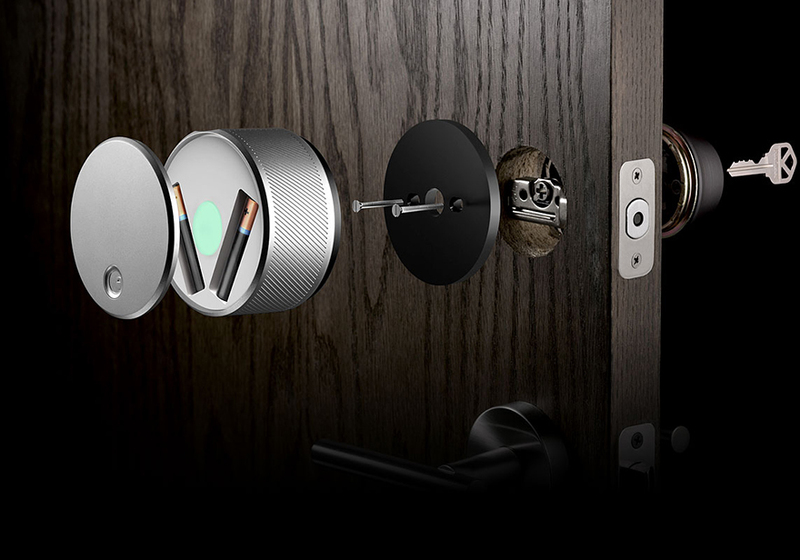 Despite the lack of launch date, the August Smart Lock will retail for $199, and the compatible software will be free for consumers (although the company does plan to charge for business use of its program.) It is compatible with iOS (and soon Android) devices via Bluetooth, and the development team has claimed it will eventually also be operable via your other Bluetooth-enabled devices. It may take some time for the concept of a hackable (rather than pickable) lock to catch on, but as homes go further into everyday technological territory, it could become an attractive option. 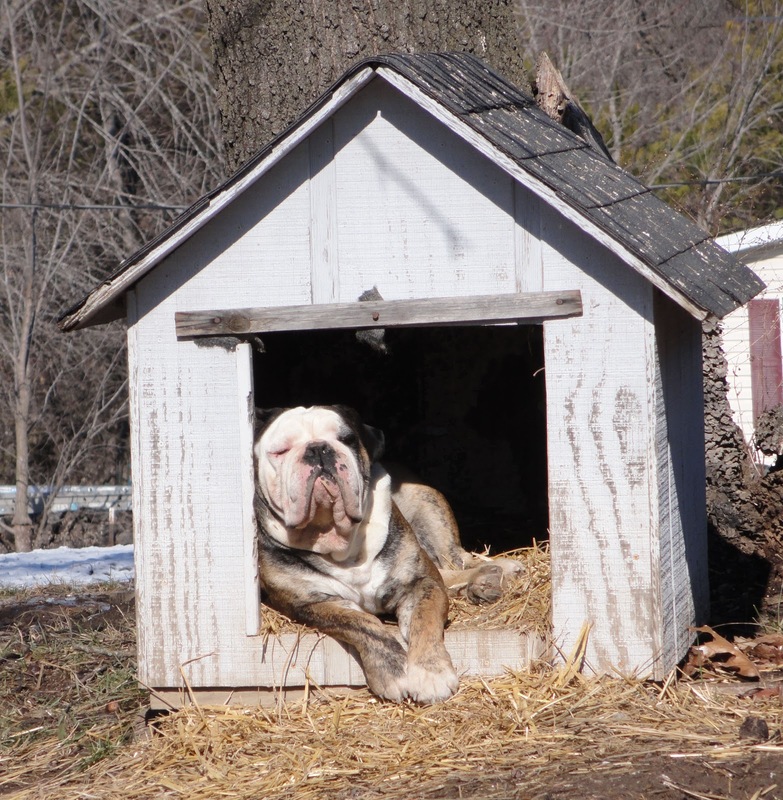 Just remember to keep your phone charged, or you're sleeping on the porch. Seriously, charge your phone. Bowser doesn't like to snuggle. If you're a fan of the astro-adventurers who make their living by working on the International Space Station, a.k.a. possibly humanity's greatest collaborative scientific achievement, you've probably at some point wondered how they were doing up there. Maybe it's because you feel a connection to their self-imposed earthly exile, maybe it's because you think they might be looking down over your city at the moment, maybe you just read a lot of our Space Station Sunday articles and feel a faraway friendship with these folks. Whatever your motivation, the new Friends In Space app lets you chat with one of the human stars of space. 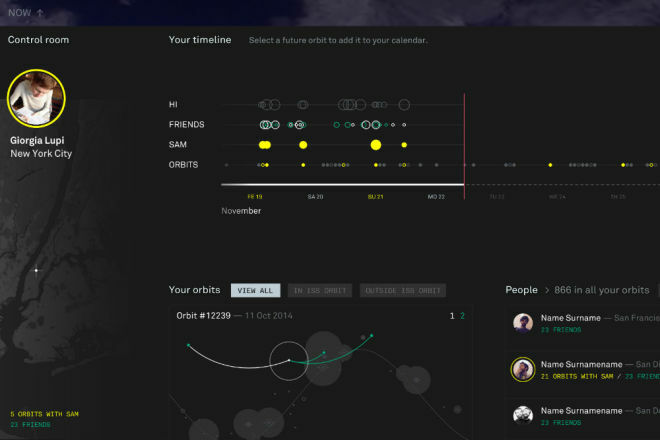 According to wired.com, the app was developed by Italian company Accurat and provides a host of spacewatching options. You can track past, present, and future orbits of the ISS, chat with other stargazers, check out audio and video from the ISS, and see the astronauts' daily schedules. 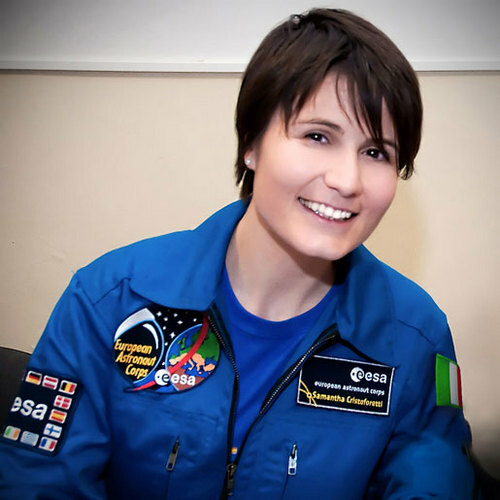 But the coolest part is the connectivity: when the ISS passes over your region, the app will alert you, and you can send a hello up to Italian astronaut Samantha Cristoforetti. Even though the astronauts can technically see all of us, it's nice for them to be reminded that we're still here supporting them. And who knows what sort of fascinating posts may show up on this new space-based social media? With lots of data available for fans and the whole world at the astronauts' hands, it will be interesting to see the daily grind from someone who is outside your normal social orbit. They totally should have called it "Spacebook" though. With fossil fuels falling out of favor as a preferred power source, it's time for green energy to get a chance to shine. Now, a refueling station in England has become the first source of solar-derived hydrogen power, readily available to fuel your vehicle. According to imeche.org, the 15MW solar electric plant in Swindon now powers an industrial electrolyser that is able to use the power of the sun to separate hydrogen molecules from water. This is then stored for use by hydrogen-powered vehicles. Hydrogen can be produced at a rate of around 3kg per hour or up to 200kg per day, with 135kg in possible storage. The first element might prove to be the best one. 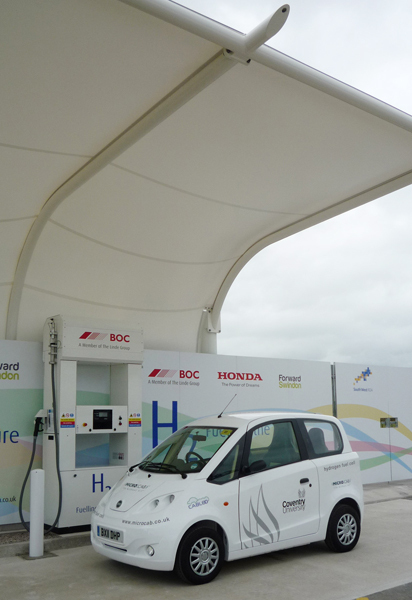 A hydrogen-powered micro-cab fills up in Swindon. Some 15 additional hydrogen refueling stations are set to become permanent fixtures in England, with shopping giant Sainsbury's even adding an onsite pump at one of their popular locations in Hendon, North London. The Swindon site will be first the major marketability test, however. Good evening, space fans! Today the crew of Expedition 42/43 set off from Baikonur cosmodrome in Kazahkstan, bound for the ISS. The launch, carried out at 21:01 GMT (16:01 EST), was a success. According to rt.com, the spacecraft will travel for 6 hours to reach the ISS. Aboard are NASA astronaut Terry Virts, Italian astronaut Samantha Cristoforetti, and Russian cosmonaut Anton Shkaplerov, who will all spend the next 169 days circling the earth. The arrival of Cristoforetti will make it the second time in ISS history that two women (the other being Russia's Yelena Serova) have been aboard for long-duration mission. As reported by ABC News, Cristoforetti has previously served as a captain and fighter pilot in the Italian Air Force. Regarding her new mission, she is focused on only the matters at hand, saying, "Space is what I do for work, and that's what I think about it: It's my work." She may be focused on work, but she's inadvertantly making flight suits part of the hot new Italian fall fashion. As for the others in this line of work, Cristoferetti is in distinguished company. According to wikipedia, her crewmate Anton Shkaplerov is a colonel in the Russian air force. He has served as a senior pilot instructor and Instructor of General Parachute Training, completing over 300 jumps. 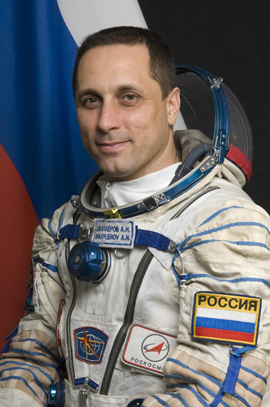 He has also served as the Russian Space Agency's Director of Operations at the Johnson Space Center in Houston, and has previously worked aboard the ISS as a flight engineer during Expedition 29/30. Not only are his skydiving credentials impressive, he's also good at sky-lurking, having conducted a spacewalk during his last ISS mission. 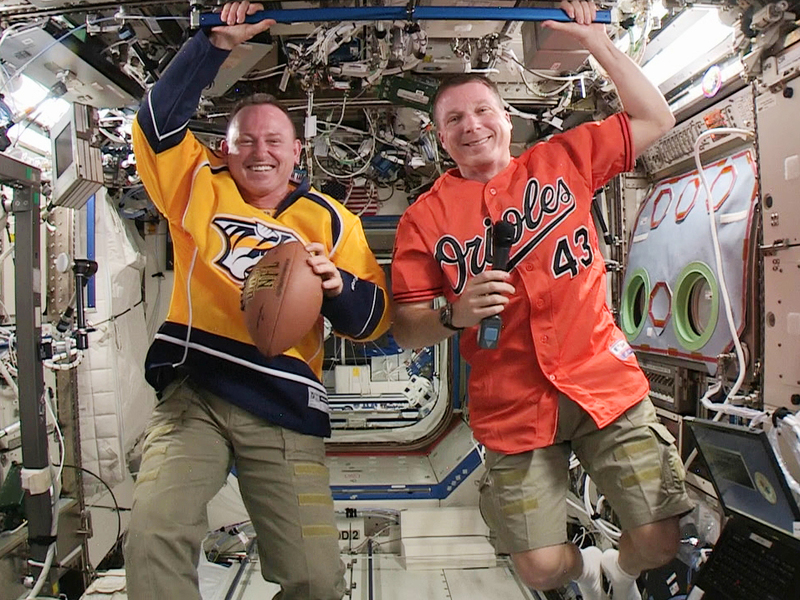 Rounding out the new crew is NASA astronaut Terry Virts, who hails from Maryland. A colonel in the United States Air Force, Virts is a distinguished experimental test pilot with over 3,000 hours spent in more than 40 different types of aircraft. His piloting expertise isn't limited to earth, as he was also the pilot of the Space Shuttle during STS-130 (which notably helped deliver the much-beloved, multi-windowed Cupola module of the ISS.) Prior to this mission, Virts had been serving as CAPCOM in Houston, communicating with the ISS from the ground. The unflappable Colonel Virts shakes off some final training in a vestibular chair, designed to practice for the effects of the mission. Astronauts Yelena Serova and Alexander Samokutyaev kept busy with installing new gas detection hardware, cleaning vents, and venting gas from an onboard air conditioner. They also worked with a chemistry experiment that will be used educationally with Russian schoolchildren. Other routine maintenance and scientific tasks were tended to on schedule. Speaking of schedule, the new crew are expected to arrive at the ISS at around 10pm EST this evening, and you can watch it live on space.com. Hatch opening coverage begins at 11pm. We'll have more details from the mission next Sunday, when we'll see how the crew has adjusted to their new floating life...watch this space! 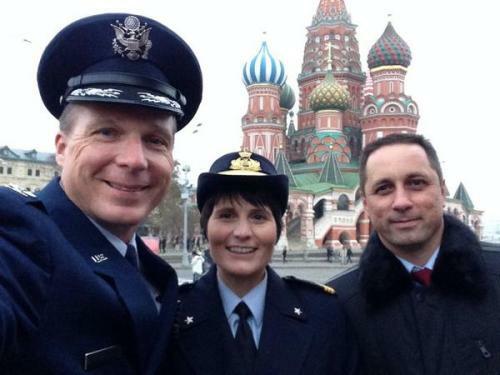 If you are reading this prior to 10pm EST on 11.23.14, these three people are currently hurtling through space. The ShotTracker system, according to wired.com, is comprised of three elements: one wrist-mounted sensor, one net-mounted sensor, and a mobile app that allows the sensors to share information via Bluetooth and concretely calculate whether you scored a shot or fell short. Shot stats ASAP. Let the future aid your freethrows. The system includes a wristband and a compression sleeve for wearing the diminutive wrist sensor at your preferred level of comfort. For $150, it will ship in early December, well in time for any Xmas-party shootouts. The durable devices are waterproof and weatherproof, and if you feel like waiting for version 2.0 in mid-2015, it will be also able to calculate your exact location on the court. ShotTracker includes a sharing program where you can compare dunks and drops with other users, and also a list of workouts so you can bring your game up to shareable snuff. Coaches can also add their own workout plans, to perfect players even outside of practice. Whether you're trying to make the team or just trying to tell if your old skills are still on point, the ShotTracker has a little something for every kind of hoop dreamer. As the ShotTracker website rightly explains, "You can't improve what you don't measure." It's like having these guys in your smartphone! 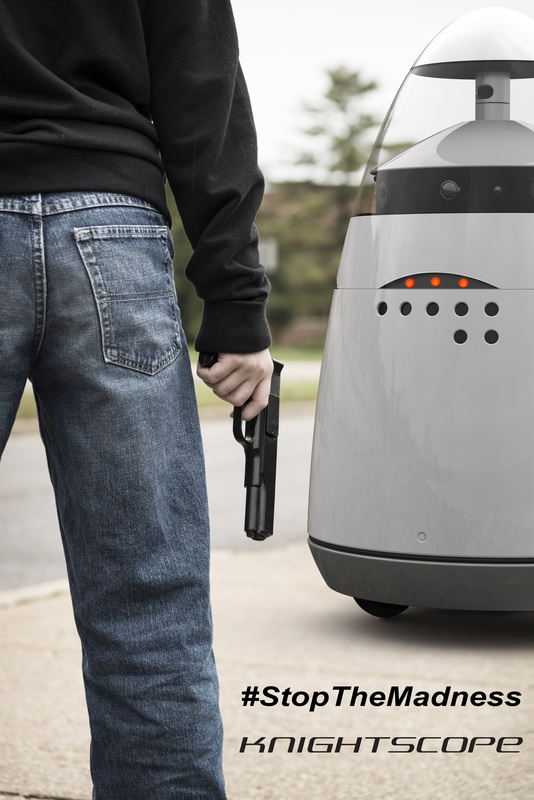 Roving Robot Security Guards: Safety Or Just More Surveillance? Surveillance robots are a fact of modern society. 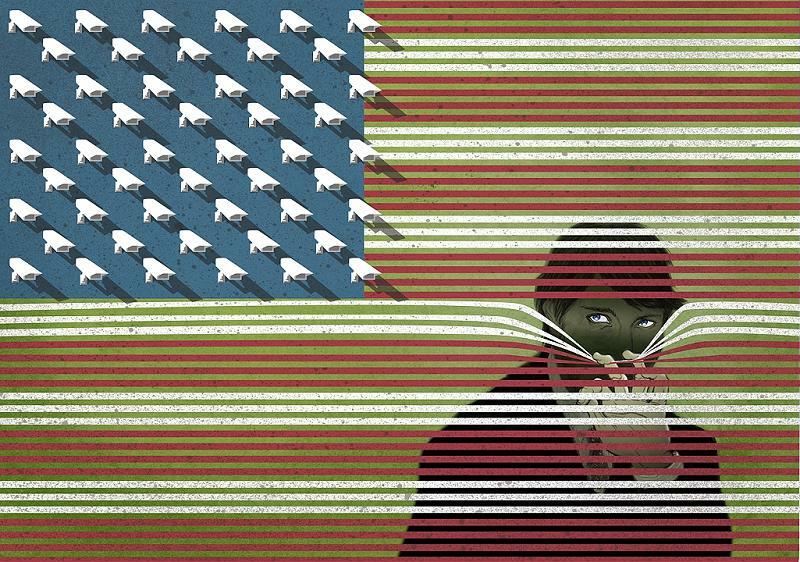 Whether they be drones in the sky, surreptitious cameras discreetly hidden in public, or even the wiles in the wires of your own computer turned against you, they are out there. Now, Silicon Valley has upped the robot game with new five-foot multi-sensory patrol droids. Every day they risk their microchips and processors, just to keep you safe. These "Knightscope" robots, according to the Daily Mail, are intended to use their arrays of microphones, sensors, and cameras to spot and report intruders. They don't have trigger fingers (or even weapons) like humans do, so they may be thwarted in a fight, but they will record you severely in the process (possibly even using their LIDAR laser ranging to make a 3D map.) Thermal imaging and even an odor sensor complete the observational package. That's right, the robot could incriminate you just by your human-stench alone. Truly a service droid, the Knightscopes operate and charge autonomously thanks to a combination of of laser scanning, wheel encoders, inertial measurements, and GPS. Eventually, their creators hope to send them out to patrol various neighborhoods or businesses, where they can operate indoors or out. Yes, it is very much like an R2 unit. C-3PO not included. A button on the top of the robot's head allows for humans to interact with a live person (not inside the robot) in case of emergency. This is a feature perhaps intended to endear the robots to humans, which seems to be part of their creators' mission, as they ask, "Imagine a friend that can see, hear, feel and smell that would tirelessly watch over your corporate campus or neighborhood, keep your loved ones safe and put a smile on everyone passing by..."
So we're supposed to "smile" at our new robot "friends." With all those cameras and sensors, they'll surely know about it and get mad if we don't. So, which gang is going to start knitting robot blindfolds? Don't start trouble in the wrong neighborhood of Silicon Valley. Are you a closet revolutionary who is constantly aware of the deterioration of society and informs themself on ways it can be fixed? Are you a casual bystander who once googled a song by a band that prided themselves on questioning authority? Are you just paranoid as hell that the Man is out to get you? Now, you can stop governmental cyber-peeping for sure, thanks to new technology released by Amnesty International. As reported by the BBC, it is no secret that governments use "sophisticated spying tools that could grab images from webcams or listen via microphones to monitor people." Amnesty International knows how wrong that is, and has released the Detekt software to combat Big Brother's unsavory advances. Detekt scans your computer for government-grade spyware that might be missed (or intentionally looked over) by other more mainstream virus or malware detectors. They're not this overt, but they are this unpleasant. Created through a collaboration between Amnesty International, the Electronic Frontier Foundation, Privacy International and Digitale Gesellschaft, the free software is designed to operate on Windows (the platform which most spied-on people are apparently using.) 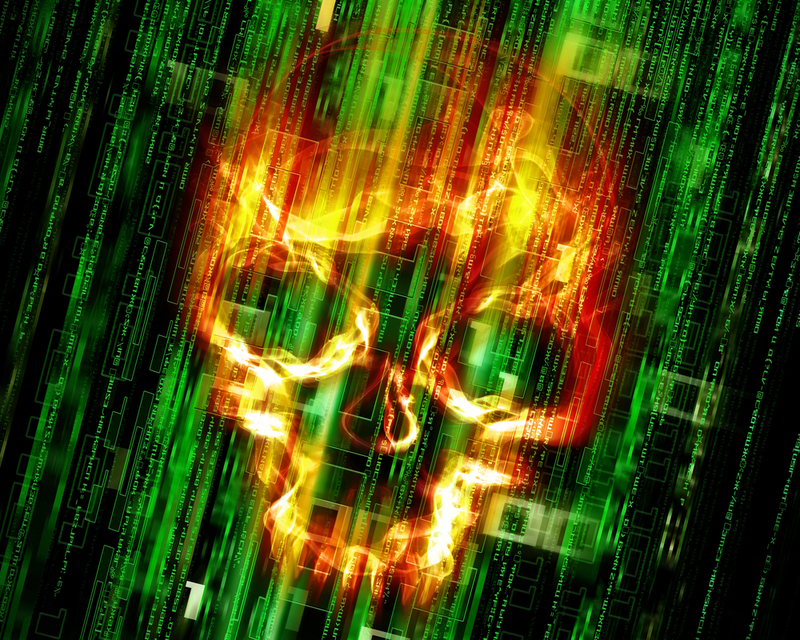 Its availability should be helpful in putting a damper on the $5 billion international government spyware market. That's your tax money, getting spent to indiscriminately spy. Kill the idea that this could ever be acceptable. 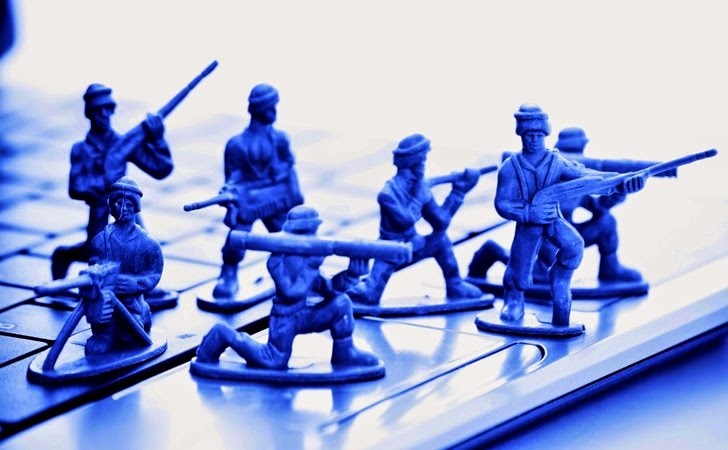 "People think the uses of spyware by governments are isolated cases. They are not," said Claudio Guarnieri, the German creator of Detekt. "Their discovery is isolated...Spyware is becoming the final solution for surveillance operations to overcome encryption. "The real problem is nobody really asked the public whether that's acceptable and some countries are legitimizing their use without considering the consequences and inherent issues." 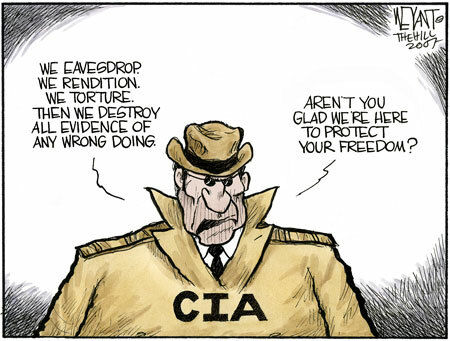 One of those inherent issues being that average civilians shouldn't be covertly spied on by their government. Better fire up the Detekt, we probably just got put on a list. There is nothing noble about blindly swinging a cyber bat at peoples' computers, hoping a pinata of prosecutable info will explode. Even if it did, that candy is probably supposed to be helping the people. Every year, 800,000 people in the European Union suffer a heart attack, but the survival rate remains only about 8%. Now, thanks to an innovative "ambulance" drone created by a Belgian engineering student, reaching people in a time of emergency can be more effective than ever. This speed, coupled with onboard defibrillator equipment, could theoretically raise the survival rate from 8% to 80%. The Ambulance Drone floats like a butterfly, shocks like an electric eel. The drone uses GPS from an emergency caller's phone to arrive at their position. Onboard cameras, speakers and microphones enable emergency service providers to coach the on-site rescuer in aid techniques until professional lifesavers can arrive. Momont wants the drones to eventually contain a "flying medical toolbox" with gear including insulin needles and oxygen masks, to provide for other types of emergencies. Now, instead of drones stereotypically raining down "death from above", a more optimistic option can take flight. This drone is considerably less helpful to your health. The Big Apple loves going big for its citizens, and now, it's doing so technologically. A new initiative is set to bring NYC "the fastest and largest free municipal Wi-Fi deployment in the world." "GIVE ME CUPCAKES...oh wait, it's not one of those cupcake ATMs. Well...GIVE ME DIRECTIONS TO CUPCAKES." Funded by ad revenue from the kiosk's lit-up sides, the machines are to operate at significant speeds using gigabit Wi-Fi, which according to planners "is more than a 100 times faster than the average public Wi-Fi and more than 20 times faster than the average home Internet service in NYC." Yes, this probably means a lot of people will use it for naughty purposes, even (or especially) due to the public location. 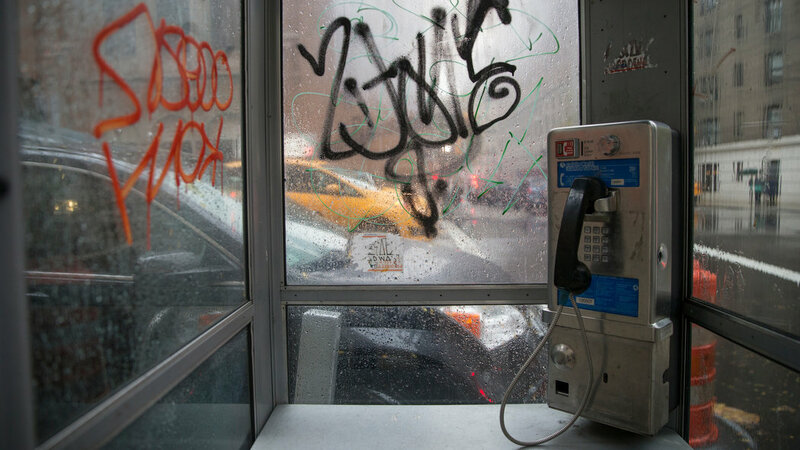 Of course, this is NYC, so some will just remain dirty with no help from the internet. It's not like you're going to miss these. Anyone with social media, a smartphone, and a proclivity for partying knows this story. You're out with friends, sipping a few libations, and suddenly the next morning there's love notes to tequila and photos of you attempting to twerk all over your facebook feed. If you're the sort who'd rather outsource self-control to a technological bouncer, you need the new Drunk Locker app. "I just told Facebook that the next three people who come party with us can do shots out of my cleavage...HAHAHA AWESOME IDEA, RIGHT?" Drunk Locker, according to its creators, acts as a "binary conscience" during your benders. Simply put, it prevents you from accessing six major social media interfaces while you're 'faced. Facebook, Messenger, Snapchat, Twitter, Instagram, and Tumblr are all strictly prohibited for use while juiced. A predetermined time selection (from one to ten hours) allows for your sober judgement to keep you out of social harm's way, and nothing (even uninstalling the app) will stop Drunk Locker from that mission. Drunk Locker is free, so you'll still have plenty of beer money. And then you might need Drunk Locker more than ever. 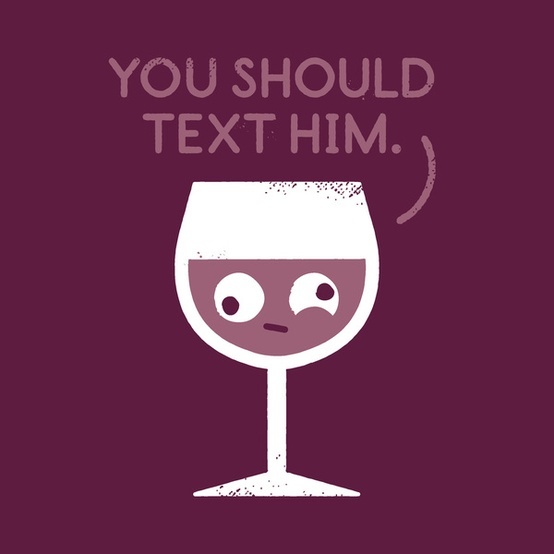 SHUT UP WINE, YOU'RE WRONG. This is the final article in our tutorial segment on building a Swift client application to query a RESTful API and serve the response to the end user in a table view. If you've been following along since the introductory article, we've come a long way, and we're almost done! But we're not at our final destination just yet. When we last left off in part four, we had added the necessary code to display thumbnail images next to our lists of inventory items. 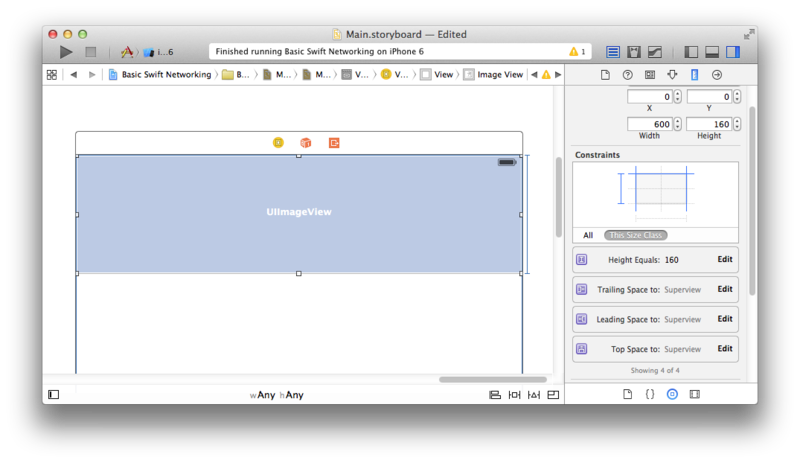 In this article, we will walk through the process of adding views for each individual item in our inventory such that when a user taps an item in the list view, she'll be presented with an item description scene that displays: 1) a bigger picture of the item, 2) the name of the item, and 3) the lengthy item description provided by the API. Let's jump right in. 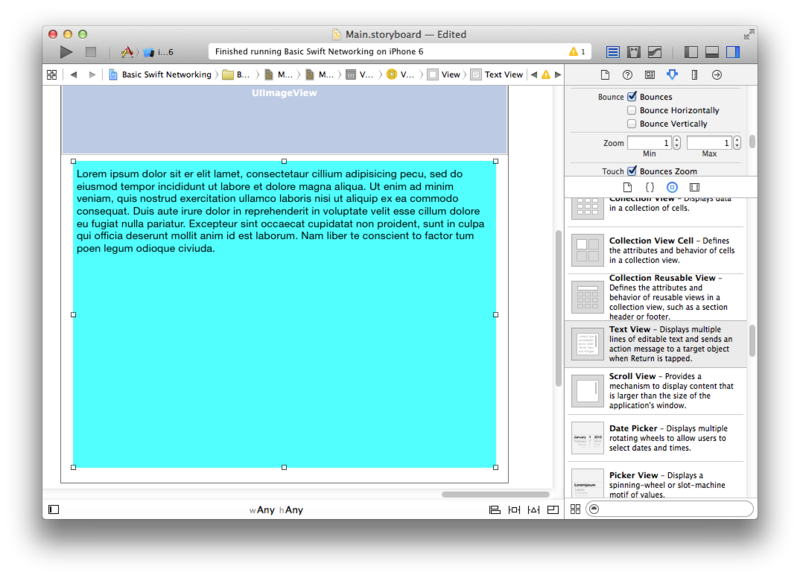 Now drag and drop a Text View into the scene, and size it as shown below with a small margin all around. (The vibrant color you see in the image below on the Text View was set by us so that it is clear what object we are referring to). Do this for both elements in the view controller (i.e. the image and the text), connecting them to the corresponding outlets in the class. On the first line, the segue object provides a reference to the destination view controller. 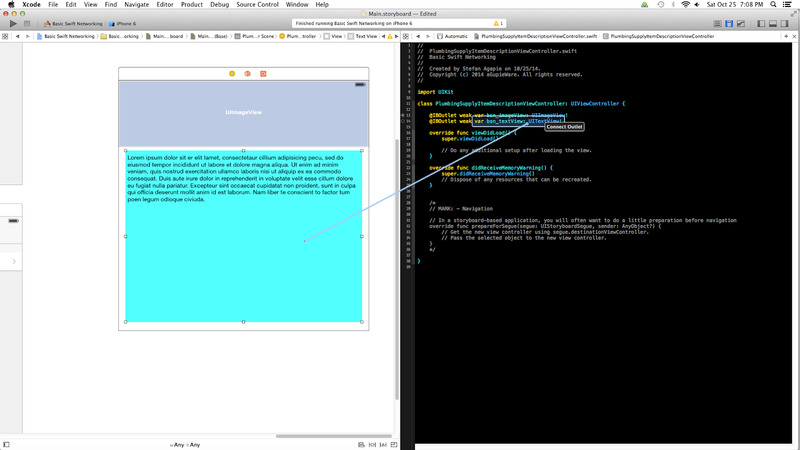 On the second line we cast the sender object that the callback method provides as a table view cell since the cell that was selected becomes the sender of this segue event. Then we grab the index of the selected cell, on line three, and use it to retrieve the associated plumbing supply item from our data source and send it over to the destination view controller on line four. To avoid having to download the image again we simply capture it in our destination view controller from the selected table view cell. Notice that the item description text is passed through a completion handler closure once the download is complete. 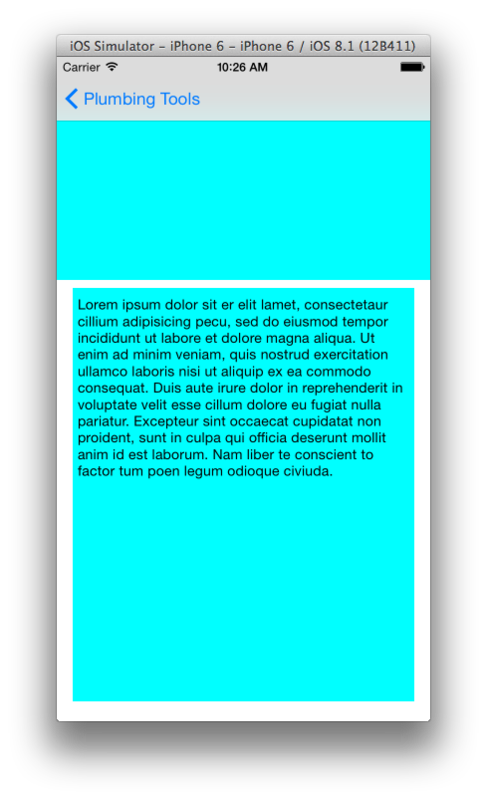 The code 'self.bsn_textView.text = itemDescription' sets the Text View's text area with the text of the item description. On the source view controller, we did not use this completion handler, which is available on its networking request method, but instead made the UI updates inside the method itself. We prefer to update the UI outside of the method that is tasked to download content as it makes for clearer code by breaking up the variegated logic into separate sections. Both approaches are possible, as we'll now see. This method takes an item's id, maps it one of two possible endpoints and inserts that item id into the selected endpoint. The mapping is done by inspecting the first two characters of an item's id and using a switch statement. This code should look familiar. We already described what this code does when we originally downloaded inventory items. The only difference here is that we passed our data for the UI element to the completion block. Success! 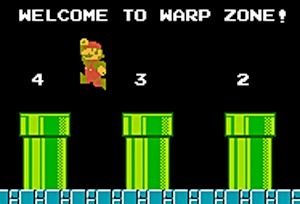 With that, we've completed the last major task for our Super PHPlumbing Bros Swift client application! When run, the client queries our custom API to first display the titles of the two inventory categories supplied by the API. When the user selects one of those categories, the app displays a list view of the inventory and provides each item's name along with the corresponding thumbnail image. 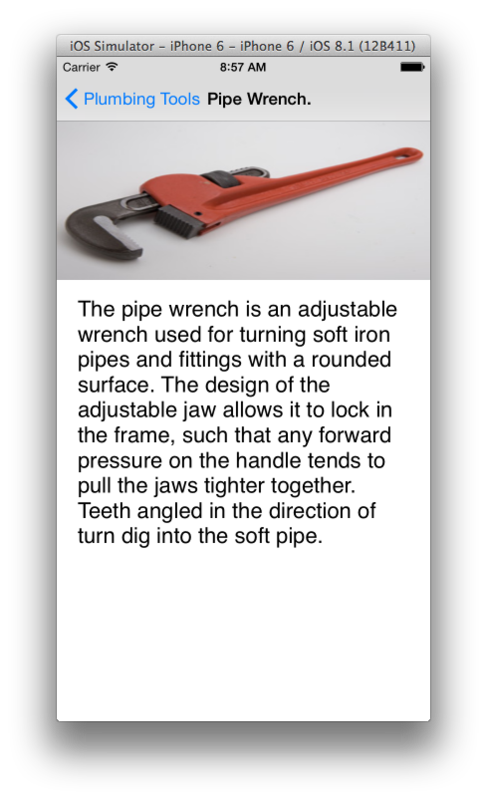 And finally, when the user selects an individual item, the app displays the full image along with the item's full description. We hope you've found this tutorial series helpful and fun. As always, questions, comments and suggestions are welcome below!